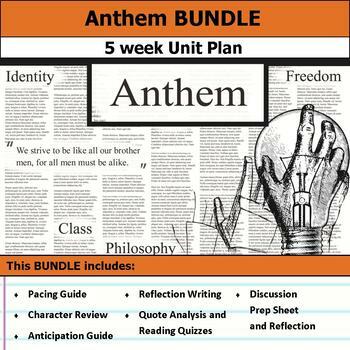 5 weeks of literary analysis lesson plans for Anthem by Ayn Rand. Includes pacing guide, pre-reading, film essay, activities, reading quizzes, notes, posters, author study, character analysis and discussions. This unit plan contains everything you need to add relevance and rigor to Anthem in an engaging way! This bundle of resources supports an in-depth analysis of the text. Students will be encouraged to think deeply and write about themes and character development with these activities. There are nine resources developed explicitly for this text, and two additional resources that can be used with any text to round out the unit bundle. Get students making "big picture" connections with this anticipation guide and reflective writing. This purchase includes a two page handout with quotes that relate to the text's theme. Students are asked to respond by indicating whether they agree or disagree with the statement and then explaining their opinion. Also included is a teacher's note to explain how to bridge this into an optional discussion, depending on how much time you have. Finally, the writing reflection asks students to relate their opinion to quotes from the text after reading. A perfect tool for scaffolding deeper understanding and analysis! This is my go-to tool for helping students process key details and providing regular reading quizzes without drowning myself in grading. The scaffolded approach helps students bridge from reading for plot points to reading for deeper understanding, themes, and life lessons. Obtain student buy-in and build anticipation for key concepts by having student’s research themes and track them while reading. Early in the unit, students research the denotation, connotation, key historical events, and illustrate the theme word or phrase. Students track key moments in the text that relate to the prompt. After reading, students consider these key events and develop the author’s theme statement. Elements of film handout, essay graphic organizer, rubric, and notes for the teacher. The elements of film handout defines 14 basic elements for students to use as evidence in their essays. The graphic organizer has students pre-plan which scenes their essay will focus on, structures their notes during the film, and plan their thesis statement. Character Analysis Packet - An organized space for students to track the development of key characters throughout a text. There is guided space for students to illustrate, describe, record and analyze evidence, and finally synthesize their ideas. Character-Theme Graffiti Table - An action-packed way to get students analyzing minor characters and how they support theme development in a text. Students work in groups to add evidence and analysis to ideas graffiti-style, encouraging them to build and develop other group’s work. Character Review Project - This is a creative project that encourages abstract thinking and evidence-based writing. Students feel confident with this semi-structured approach to class discussions. This purchase includes a 20 slide PowerPoint that introduces students to the Socratic method for the purpose of discussing a text, a student discussion prep sheet and reflection, and detailed instructions for the teacher on how to facilitate a class discussion. The PowerPoint also includes theme questions to help students expand their perspective on the text, or to extend a discussion that needs to delve a bit deeper. Engage students in the text using the writing platforms they are most familiar with: facebook and twitter posts. These resources support higher-level thinking skills and a literary analysis based approach to teaching. This resource includes four copy-and-go handouts: author facebook profile, facebook newsfeed, facebook exit tickets, and twitter exit tickets. There is also a note for teachers detailing multiple ways to incorporate these resources into your unit plans, including ways to use them as reading quizzes and assessments. Highlight key themes and pique students interest with this printable poster. The image can be printed on 8.5x11 and 8.5x14 paper for a bulletin board, student workbook covers, etc. There are two styles: clean and crumpled. You can print this poster on any paper color for endless variety. You can also enlarge the image for a bigger display. Interested in more resources for Secondary ELA?